PURPOSE. To characterize the MYOC genotype correlation with phenotypes in an isolated Greek population with a high incidence of glaucoma. METHODS. Five hundred thirty-one villagers were enrolled in the study. Participants underwent a comprehensive ophthalmic examination. All three exons of myocilin were bidirectionally sequenced. Power calculations and measured genotype analysis was conducted using the genetic variance analysis program, SOLAR version 4.2, to account for the relatedness between individuals. RESULTS. The participants, 376 of whom were linked in a single 11-generation pedigree, ranged in age from 10 to 95 years with a mean age of 49. 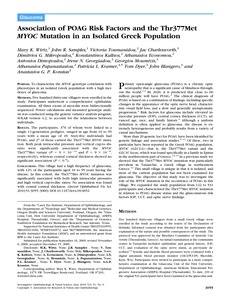 Sixty-five individuals had POAG, and 27 of those carried the Thr377Met MYOC mutation. Both peak intraocular pressure and vertical cup-to disratio were significantly associated with the MYOC Thr377Met variant (P = 9 x 10(-14) and P = 9 x 10(-8), respectively), whereas central corneal thickness showed no significant association (P < 0.7). CONCLUSIONS. This village had a high frequency of glaucoma, with 12% of the participants aged 10 to 95 years having the disease. In this cohort, the Thr377Met MYOC mutation was significantly associated with both high intraocular pressures and high vertical cup-to-disc ratios. No association was found with central corneal thickness.